Hello! It's Tuesday and it's time for another Currently List! 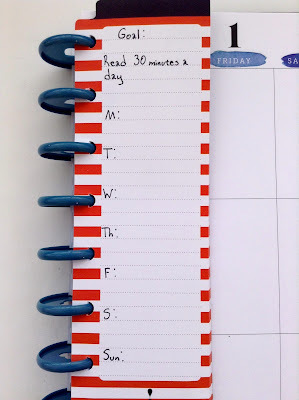 This time, I decided to use the Currently List that is in my Me & My Big Ideas planner. Reading: This is a really good book and I am taking my time with it. I can't wait to read Why Not Me? next. Planning: This year is going to be the year of adventures. I can't wait to visit new places as well as places that I have already been to. Watching: A lot of my favorite shows are back on, but there are a few shows that are ending soon. There are also some episodes that I need to catch up on. Trying: I'm trying new crafting and art journal techniques. I have also been trying new recipes as well. Cooking: I am obsessed with my crockpot and have been making crockpot meatballs a lot. Eating: I have been craving and eating lots of sweets and comfort food. Drinking: I'm still drinking lots of hot chocolate and am very happy that I'm not drinking a lot of soda. Thinking: I can't wait for Spring and Summer to get here. You may be surprised to see that I included Summer since it's not my favorite season, but I am so over the cold, gloomy weather. 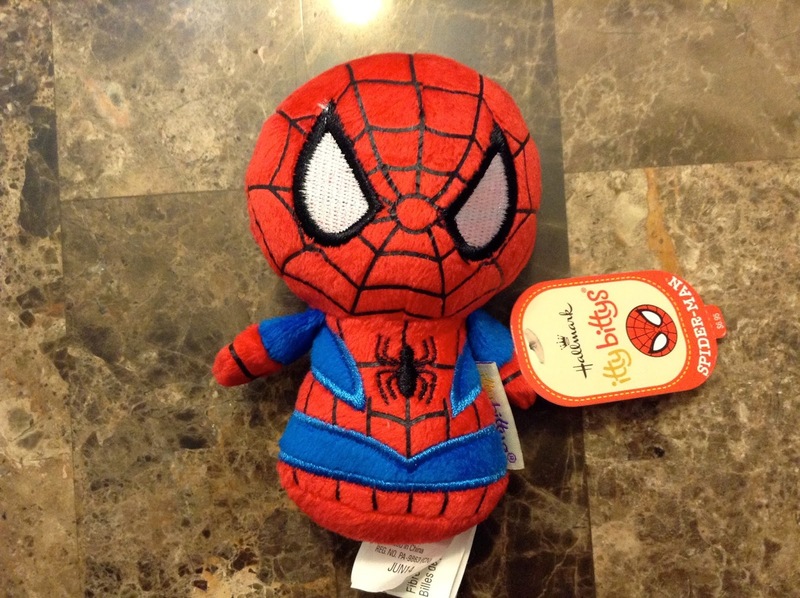 Pinning: I've been pinning some Influenster stuff. Crafting: I've been making lots of cards, layouts, and working in my art journal. 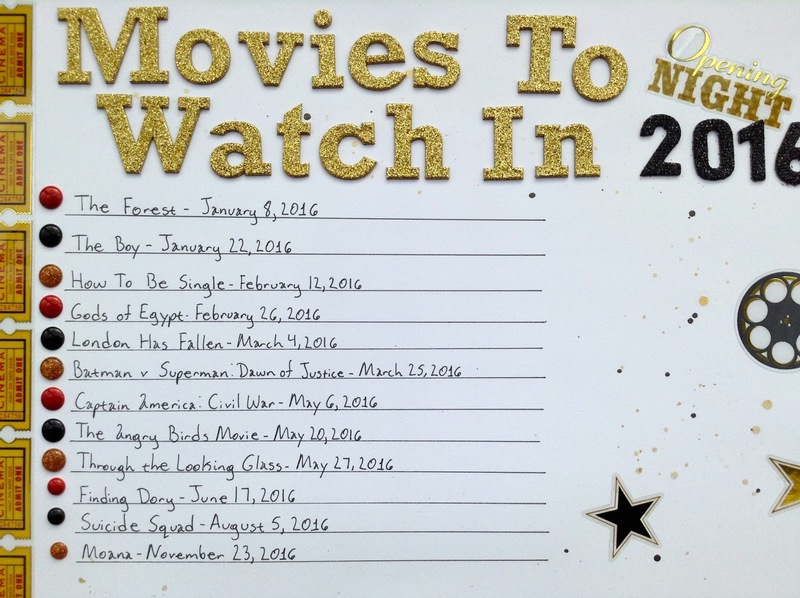 Going: There are so many good movies out right now and this year is going to be a year filled with some awesome ones. I can tell that this year, I will probably be going to the movies a lot. Thank goodness for AMC Stubs Rewards Program. Loving: You may have heard that I am on the Nerd Nest Challenges Creative Team and I am loving it! Don't forget that the last day to enter to win a prize for this month's challenge is January 31. You can link up your takes at the bottom of any of this month's Nerd Nest Challenge posts. I can't wait to see what you all create! Dreaming: We could seriously use a vacation...even a staycation. I think we are still recovering from the holidays and a vacation would definitely help us recover. Feeling: I have been feeling really excited. I'm excited about this year and the possibilities. Listening: Stressed Out by Twenty One Pilots is an amazing song. It's been on repeat...a lot. Celebrating: My 25th birthday was on the 5th and although I was dreading turning 25, so far being this age has been awesome. 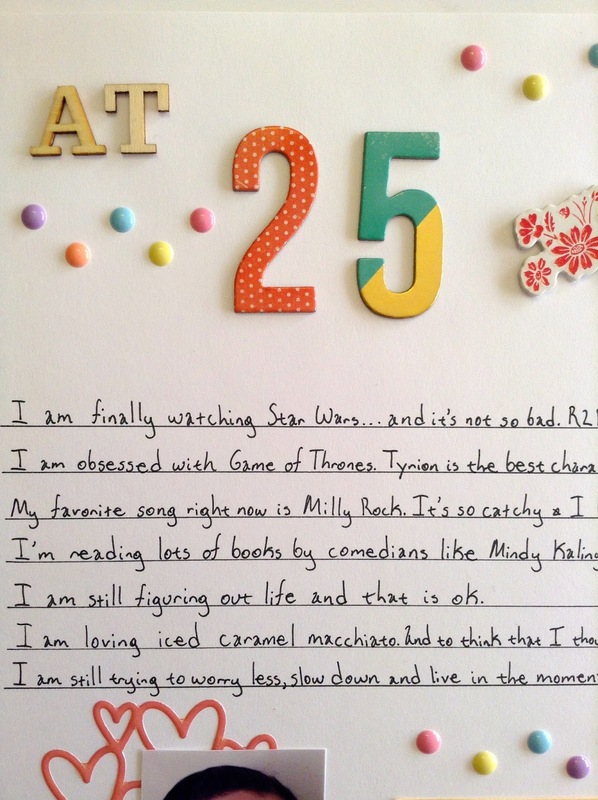 And to think that I thought turning 25 was going to be scary and awful. Improving: One of my goals this year is to increase the amount of blog posts that I actually post. I am very happy to say that this month is looking great! Hopefully, I can keep this up throughout the year. Hey! Over the weekend, I decided to make a traveling crafting kit. I have been wanting to make one ever since I decided that I wanted to explore my city more. I plan to visit new places as well as old places and I want to be able to document it. 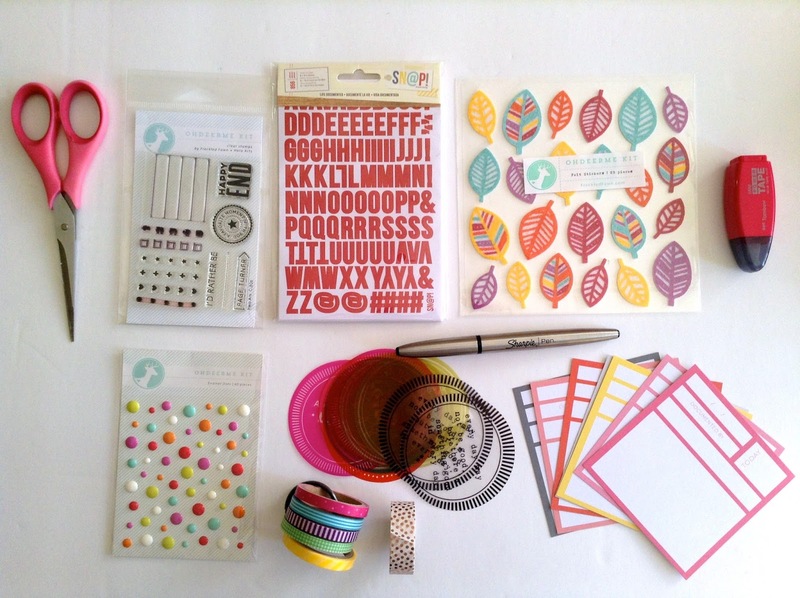 If I have time to craft while I am out and about, this kit will be perfect to get it done. I subscribe to Freckled Fawn and won a giveaway a few months ago so I have an extra October 2015 kit. I decided to use the extra pouch to hold the items for my travel crafting kit. Look at all the goodies inside! I decided to put the essentials in my pouch. I wanted to put items that I use in various projects like layouts, cards, art journals, etc. My essentials are enamel dots, washi tape, stickers, and adhesive. 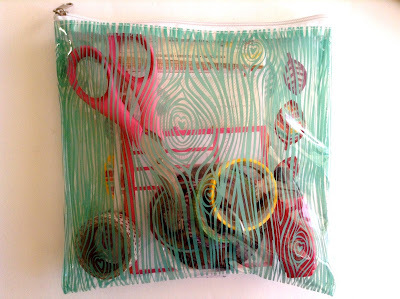 I will most likely use this kit for my art journal so I chose items that were mainly flat. The only thing that will have some dimension are the enamel dots. 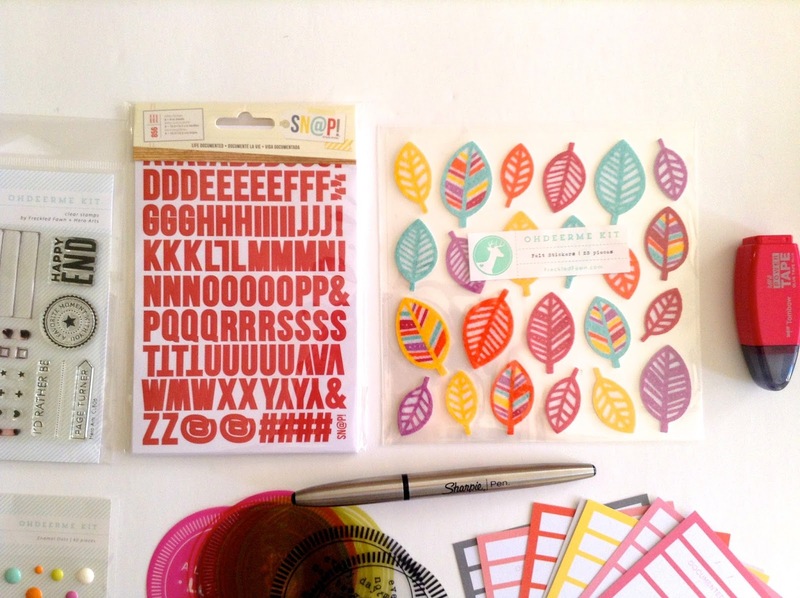 I added some items that were in the October 2015 kit such as the enamel dots, transparency circles, one roll of washi tape, and the felt feather stickers. 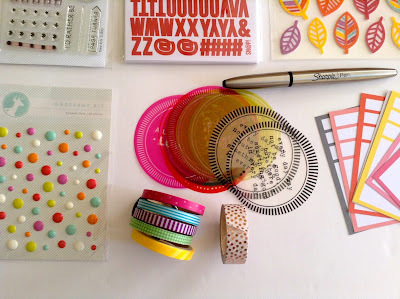 I do a lot of stamping so I will be adding an ink pad to my kit. I also added one of my favorite stamp sets which is a Freckled Fawn stamp set from September 2014. Below are a few close ups of the items in my kit. I think this kit is awesome and has everything that I need. If you decide to make a travel crafting kit, I recommend that you add your essentials. Everyone has a different style and some people may use other items that are not pictured. Add the items that you know you use the most, but if you are trying to use up your stash then maybe you could add a few things that you have kept for a while. Have you made a travel crafting kit? What do you keep in it? Hey! Hey! Wow, it's been a long time since I shared a page from my art journal. That will definitely change this year. Last Saturday, I worked in my art journal and used a few new items so I'm excited to show you all my favorite page . I purchased some Tim Holtz mini Distress Inks and mini ink blending tool a while ago and have been wanting to try them out, but felt intimidated. I finally decided to try them out and used a Heidi Swapp stencil. I love how the colors blended and made kind of like a green or yellow-green color in some spots. I didn't know where exactly I was going with this entry. I literally had no idea whether I should add writing, a picture or embellishment so I decided to check out what I had in my crafting basket. 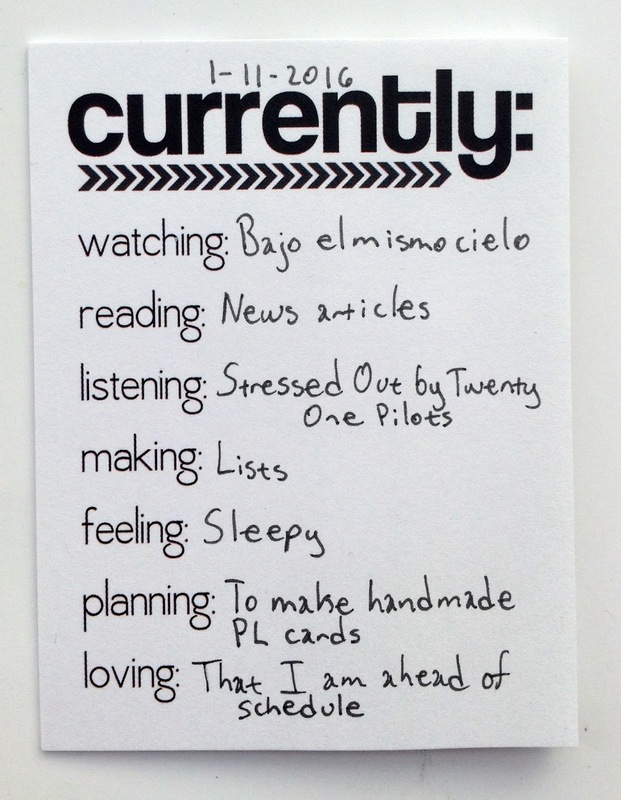 I found a Project Life card and decided to use it to decorate the page. 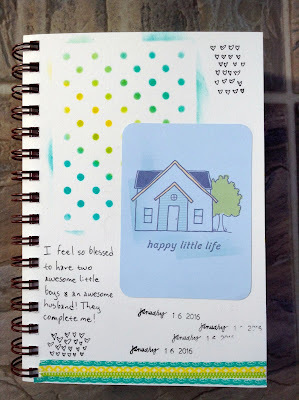 I also decided to use the sentiment on the card like a prompt and journaled a bit about my love for my boys and husband. I always keep a medium sized basket with various items that I know I will use in various projects. I have been crafting downstairs a lot so keeping this basket has been convenient and I haven't had to make a lot of trips to my room to get stuff. If you tend to craft in various areas of your house, I recommend getting a small or medium sized basket and fill it with items that you will use in lots of projects like Project Life, cards, mini albums, traditional layouts, etc. 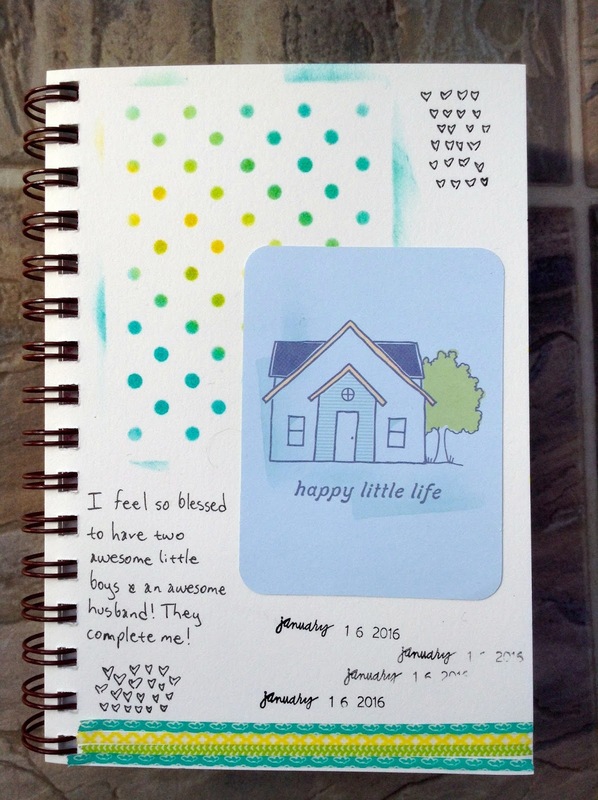 Do you have an art journal? What have you been making? Hey there! On Sunday, I made a batch of cards. I didn't focus on a specific theme instead I made cards for various occasions. I think that this may be one of the few times (if not the first time) in which I didn't have a set idea or theme when it came to making cards. Usually when I make cards, I have a specific theme, holiday, event, etc. and already know which supplies I need to use. This time, I used a collection pack that I have had for a while and decided to just make whatever came to my mind. 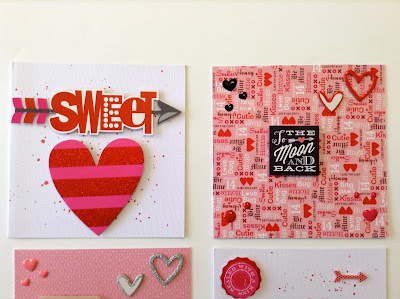 I primarily used the My Girl collection pack from American Crafts. As you can tell by the name, this collection pack is very girly. 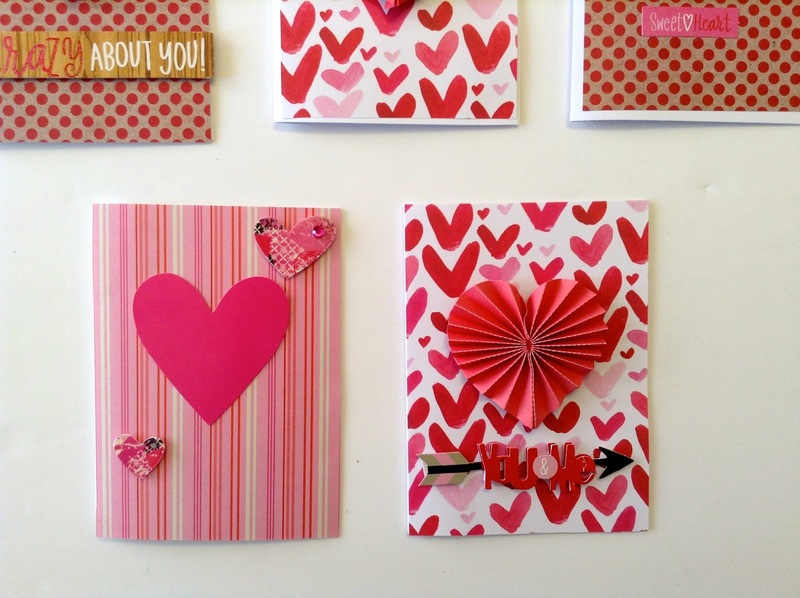 It has lots of pink and girly elements, but I didn't want to make cards just for girls. I wanted to make a few "everyday" cards for those days when I just want to say hello to a friend. I also wanted to make cards that could be used as an anniversary card or Valentine's Day card. I also made a birthday card and a card in Spanish. Lately, I have been obsessed with doilies and have been using them in a lot of cards and Project Life cards. Adhering them can be a bit tricky, but I ended up using a clear glue dot runner so that nothing would show through. I love the cut apart pages that was in the My Girl collection pack. The cut aparts were perfect to use as sentiments and embellishments. 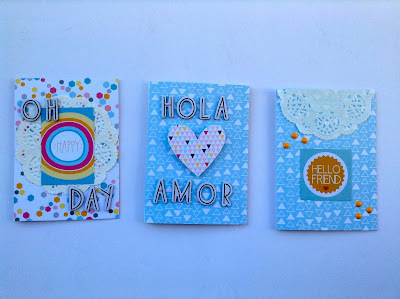 One of my favorite cards is the "Hola Amor" card. I definitely plan on making more cards with Spanish sayings especially since I am Dominican and I have several family members that do not speak English. I used some foam dots to give dimension to the heart die cut. 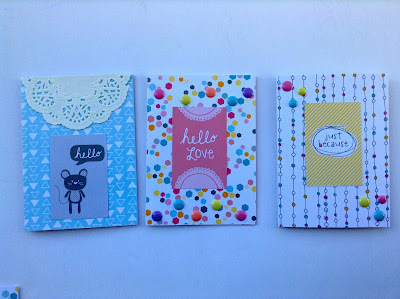 As usual, I used enamel dots on several of the cards. I really love that birthday card and intentionally left the bottom left of the card blank so that I could add some number thickers. I don't know who the recipient will be for this card so I didn't want to add a random age. Once I know who to give this card to, I will add the numbers for an even more personalized look. I still don't know how to feel about that "Sweet Love" card, but I'm loving the gold thicker. The "Hello Lovely" card is another one of my favorites. 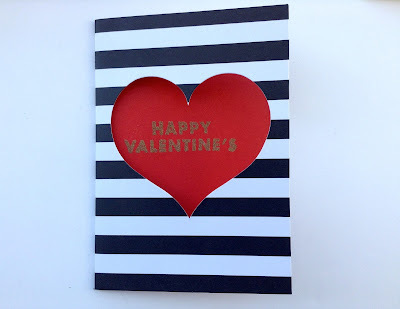 Usually, I cover the entire card with patterned paper and have never tried to make a card with only a portion of patterned paper covering the card. I'm loving the colors and the large letters. It was so much fun just creating without having a set plan or theme. It was also fun trying new things and testing out different styles. I definitely plan to do this more often. Hello! 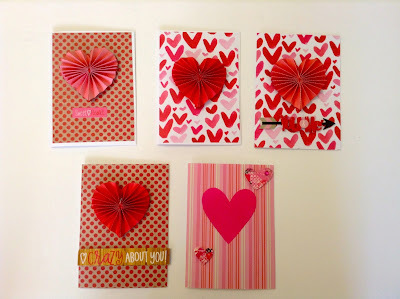 I have been sharing some Valentine's Day cards that I have been making over the past couple of weeks. 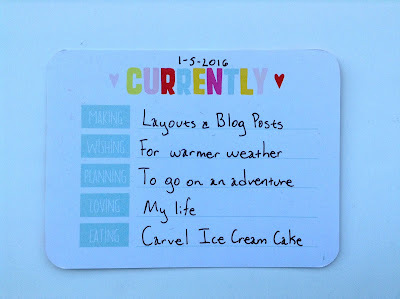 You can check my previous blog posts on the cards here and here. Today, I want to share another batch of cards that I made this past weekend. To make these cards, I used a kit that I bought from Michaels. 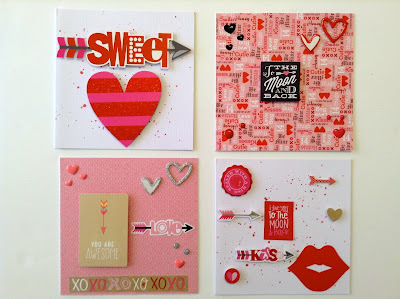 They have a new Recollections Valentine's Day stamp card kit that is awesome! It comes with 12 cards and envelopes, 1 clear ink pad, 10 clear stamps, 1 acrylic block and a small container of embossing powder. I have been wanting to try embossing powder on some handmade cards for a while so this was perfect. These cards were easy to make. All you have to do is attach the clear stamp onto the acrylic block. Then cover the stamp with the clear ink. Stamp the image onto the red card and then pour the embossing powder on top. I recommend that you use a funnel tray so that you don't make a mess and you can add the remaining powder back into the container. You can either let the powder air dry or use a heat tool to quickly dry the cards. I really like how the cards came out. It looks simple, but the heart and the embossing powder makes the card stand out a bit. I love the red and black combo as well. You can never go wrong with red and black on Valentine's Day. I'm almost done making all of my Valentine's Day cards. Be sure to be on the lookout for my next batch of Valentine's Day cards. Have you made any Valentine's Day cards? Hello! 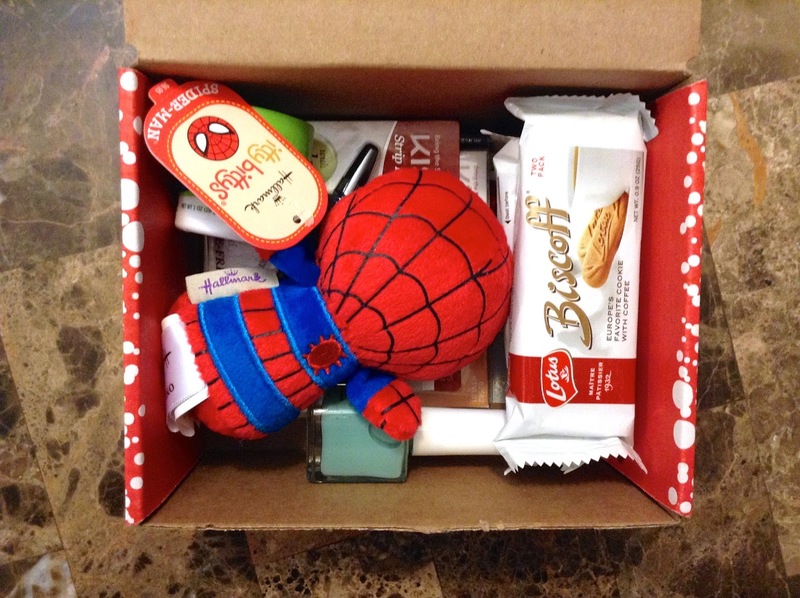 A few days before Christmas, I received my Jingle voxbox from Influenster. I was super excited to receive it and see what was in the box. It was such a nice surprise to receive this right before the holidays. It felt like an early Christmas gift. How cute is that box? This box was packed full with lots of goodies which was so awesome! As soon as I opened it, I knew it was going to be a good one. I really love that Influenster adds a card with all of the items that should be in the box. 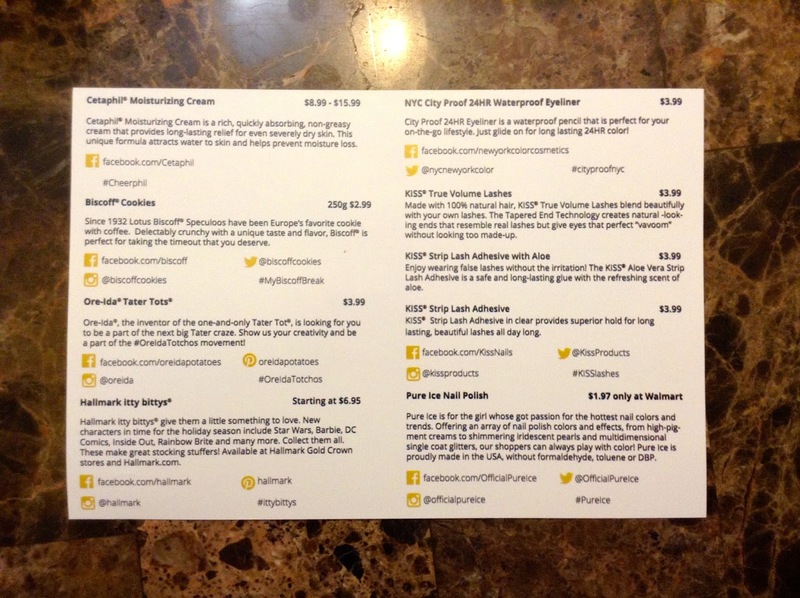 They even include the retail value of the items along with the company's social media pages and hashtags. These cookies are so good! 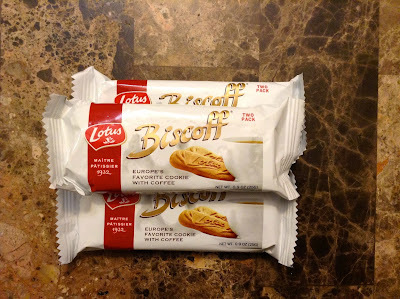 Even though the package says "Everyone's Favorite Cookie With Coffee", I have been enjoying them with my hot chocolate. It's perfect for when I have to go run errands. I just grab my drink (it's been hot chocolate these past few weeks) and a pack of Biscoff cookies. I will admit that I have not tried these. I am a little afraid of actually putting these on myself. I keep thinking that I'm going to screw this up. Hopefully, I will try them this week. I absolutely love the color of this nail polish. It does take a few coats to get a nice vibrant look, but it does look nice. 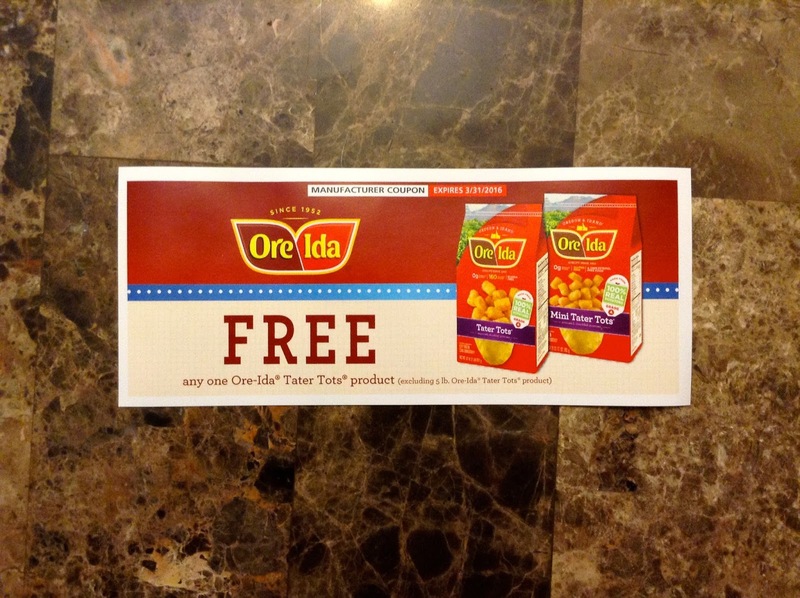 In this voxbox, there was a coupon for some free Ore-Ida tater tots. I'm not a big tater tot fan, but my boys and husband loves them. I'm really excited to try this because I have tried other Ore-Ida products before so I'm sure that these will taste great. This cream is fantastic! It's perfect for dry skin especially during winter time. I love that it is not greasy and there's not an overwhelming scent. My skin has been nice and smooth. I definitely plan to purchase a larger bottle once this runs out. Oh my goodness! This is just too cute! My boys love this and now want some of the other ones. I love that they even have Disney characters. I also saw that there were some Star Wars characters that I think my boys would like. These are perfect for little gifts or adding to goodie bags. I have tried a product from New York Color before and was happy with the product. I do like this eyeliner. 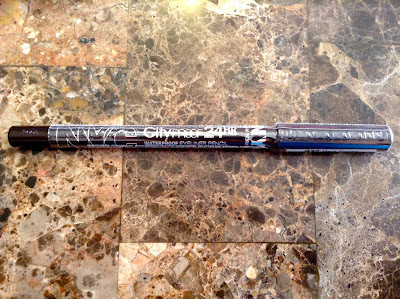 It was easy to use and lasted for a long time so it was nice that I didn't have to reapply it after a couple of hours. Overall, these are some really cool items that I received and I definitely plan to purchase many of these items in the future. 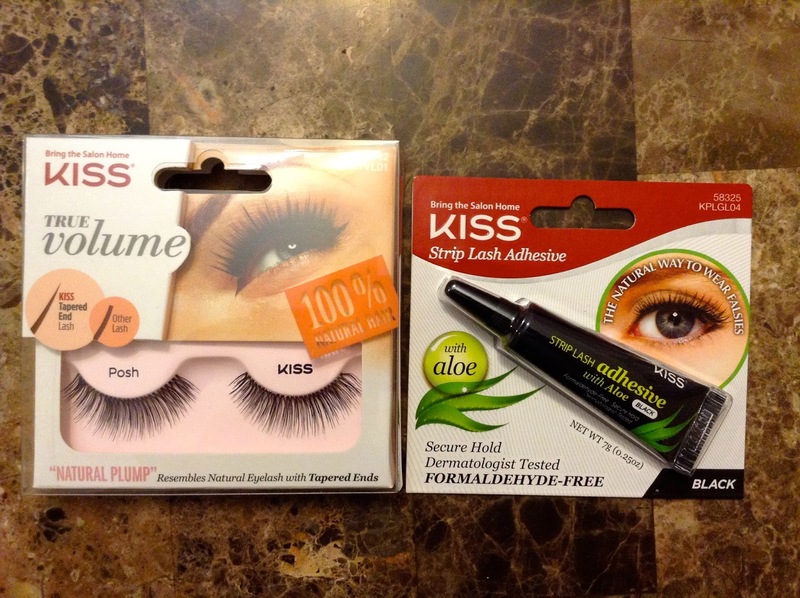 Be on the look out for a post on my attempt to try the lashes and a recipe using the Ore-Ida tater tots. Hello! 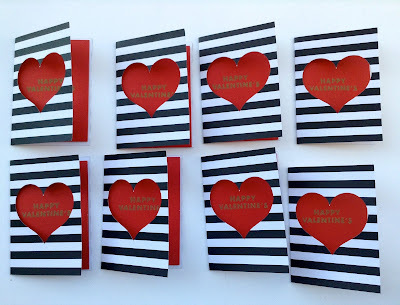 Last week, I posted some Valentine's Day cards that I made. You can check that out here. Today, I want to share another batch that I made. Lately, I have been loving these 5.5x5.5 inch cards. I really like the size and love that I am able to add a bit more of embellishments to my cards. 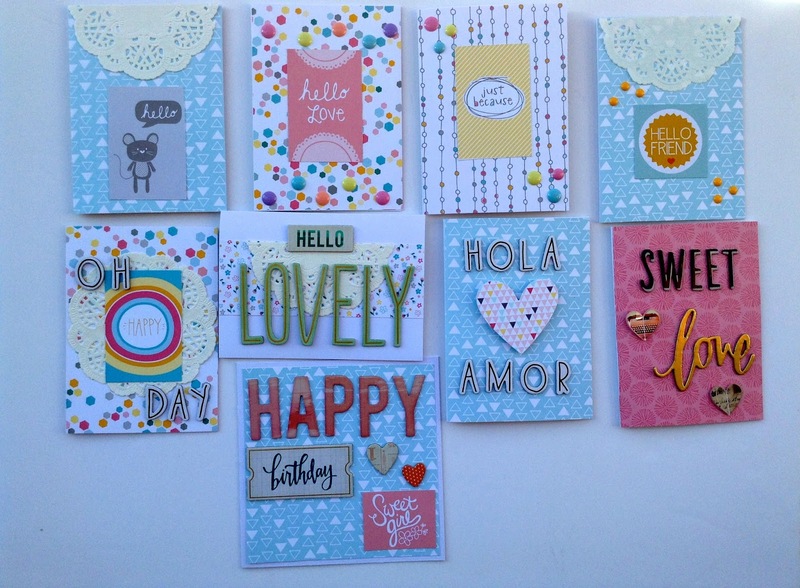 I used a mix of items in my stash as well as items from the 8x8 Me & My Big Ideas Love scrapbook kit and a previous Freckled Fawn kit. I decided to get a bit messy with this batch of cards so I added some color shine to two of the cards. Instead of just spraying the mist, I unscrewed the cap and tapped the top so that I would get some splatters. I have noticed that I am mainly using my mists this way and I love it. I also adhered some patterned paper to two of the cards. I used my Tombow Xtreme Adhesive to adhere the paper to the card. Then I added a few embellishments. When adding my embellishments, I usually try to pick one embellishment to put in the center and then I decided where to put the rest of my embellishments. My favorite card out of the batch is the card that is pictured above on the left. How cute is that "You Are Awesome" ephemera? 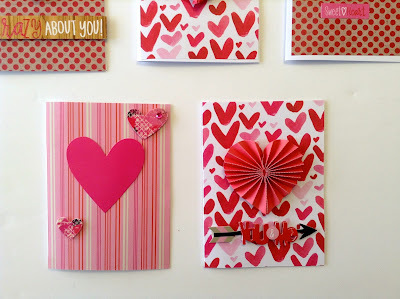 I plan to make a few more cards so be sure to keep an eye out for another Valentine's Day cards post. 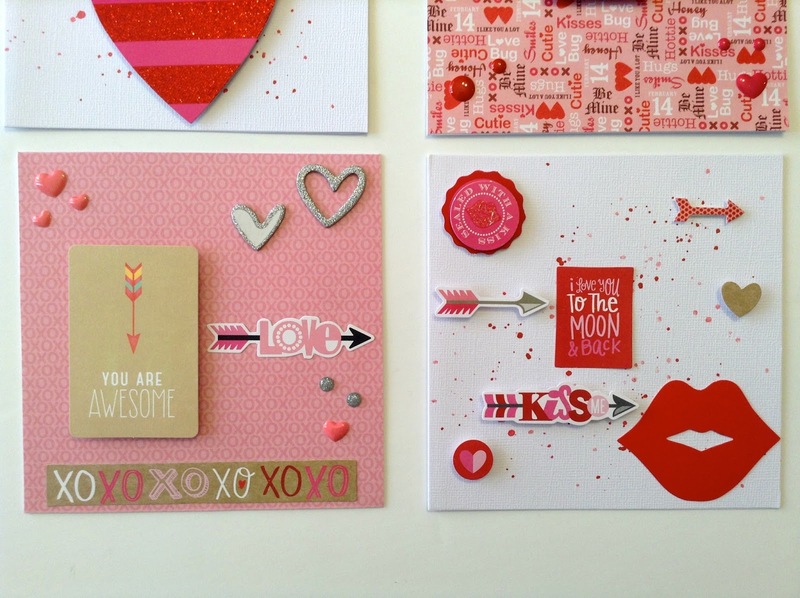 Are you making any Valentine's Day cards? Have you gotten started? Hey! Hey! I am so excited for what is in store for 2016! I said it before and I will say it again...2016 is going to be amazing! There are many things that I am looking forward to this year and one of those things are the movies that will premiere this year. 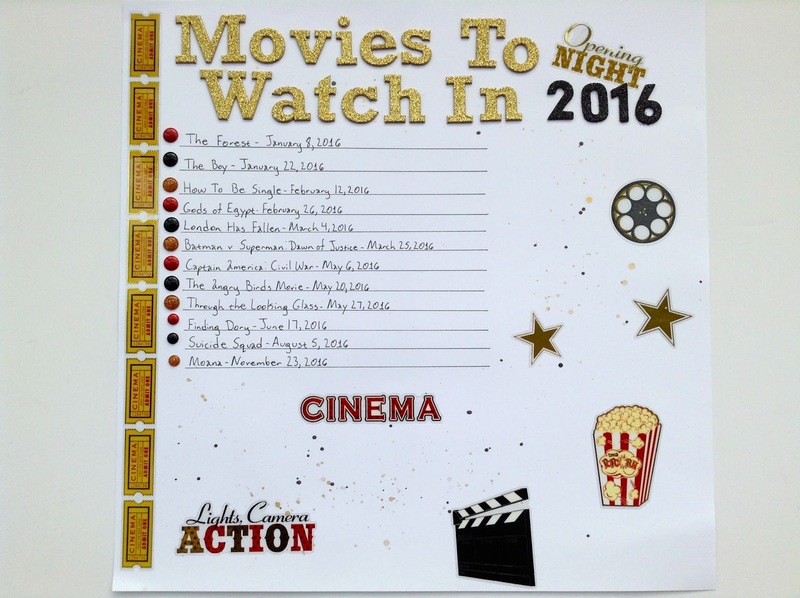 I decided to make a layout with a list of the movies that I hope to watch in 2016. 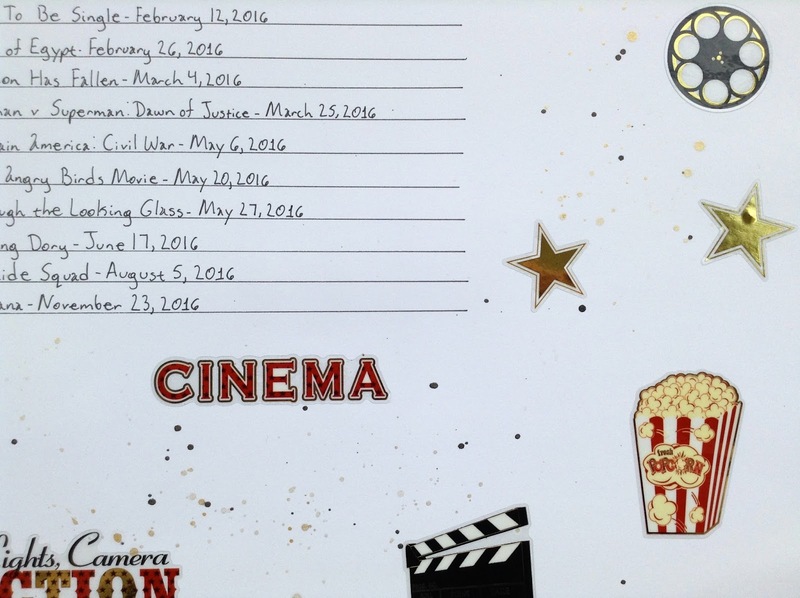 For this layout, I wrote down the names of the movies along with the days that they are (or will be) released. I have actually watched The Forest so I can cross that one off my list. John and I might watch The Boy on our date night. I do need to plan to watch Star Wars, but I have two other Star Wars movies to watch first. I wanted to use some black alpha stickers or thickers, but I didn't have the size that I wanted so I decided to just go with gold alpha stickers. I also noticed that I was running out of some larger sized enamel dots so I just used a few small ones to complete the look. I'm learning that it's ok if something doesn't turn out the way you thought or wanted it to. Everything does not have to look perfect and there are ways to make things work. I loved adding some cinema stickers as well as the color shine. To add the color shine, I unscrewed the bottle and just tapped the part that you push down to spray (if that makes sense). I didn't want to actually spray the mist because I didn't want large splatters and spots. Are there any movies that you look forward to watching this year? Watching: This novela will be ending very soon and I'm a little sad. It is such a good novela and I love the story. The actors and actresses are really great too. Reading: I've been reading lots of news articles. Some of the things I read are about the Powerball, the Golden Globes, and David Bowie. Listening: This song is awesome! It's been on repeat today. Feeling: I had a ton of stuff to do today, but luckily I finished everything ahead of schedule. Loving: Even though I had a lot of stuff to get done and I'm exhausted, I am really loving that I am ahead of schedule. I think I see a nap in my future. First Take on the Nerd Nest Challenge!!!! Hello! Hello! 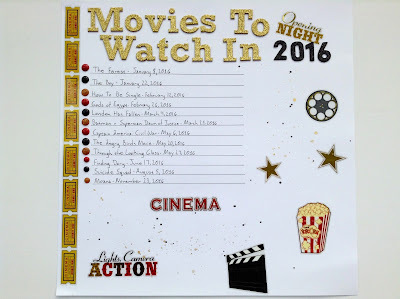 Today I am over at the Nerd Nest with my take on the first Nerd Nest Challenge of 2016. If you have any time, please click here and check out my take on the challenge. I can't wait to see what everyone makes for the first challenge! Here's a sneak peek of my take on the challenge. Happy Sunday! Can you believe that we are already in the double digits for January? This week has been so awesome! 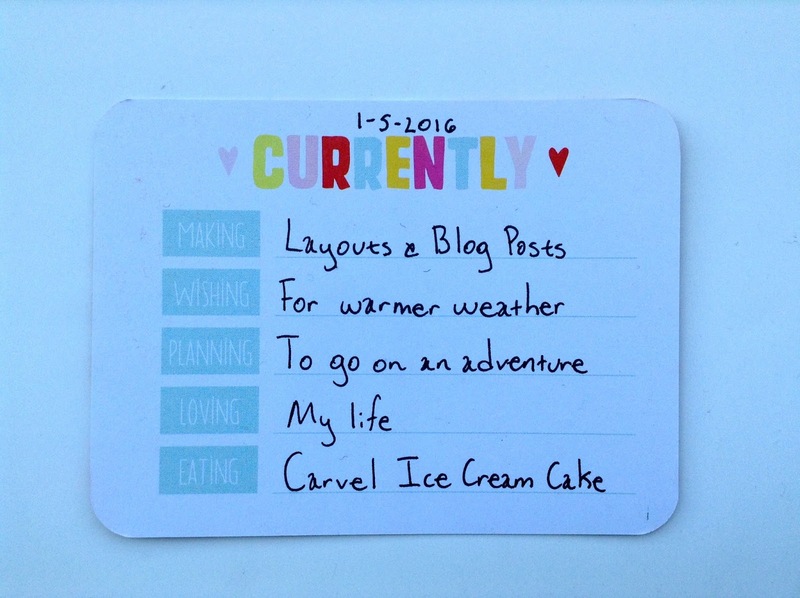 Today, I'm sharing a list of things that made me happy this week! 1. My birthday. I turned 25 on the 5th. A few days before my birthday, I began to panic and dread it. Once it was actually my birthday, all of the dread and panic was gone. Turning 25 isn't so bad after all. 2. 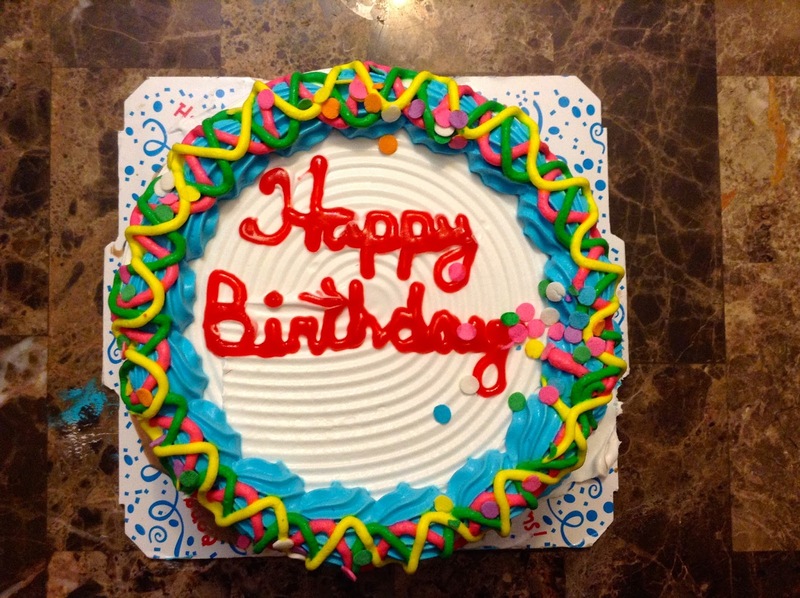 John got me a Carvel ice cream cake. 3. My mom surprised me with an Oreo cake, dinner, and birthday decorations on Saturday. 5. My Freckled Fawn-January 2016 kit came early. It was a nice surprise! 6. Finding Crate Paper Hello Love and Dear Lizzy Documentary 12x12 paper pads at Michaels. I got the Crate Paper pad for 60% and the Dear Lizzy pad for 50% off. Hello! Hello! A while back, I received my fifth book from Blogging for Books. I chose to read and review Rare Bird by Anna Whiston-Donaldson after I had found her blog. While reading her blog, I found out that she and her family had suffered a terrible tragedy and that was the death of her son. When I found out that she had written a book, I put it on my to read list. A few weeks later, I saw that the book was on Blogging for Books and immediately requested a review copy. This book took me longer to read, but this due to me wanting to read this book slowly and just trying to go over family member's personality and how they dealt with grief. This book is about Anna Whitston-Donaldson's family and how they are coping with Jack's death. In 2011, there was a lot of flooding in Washington, D.C. While Jack was out playing, he fell into a creek. I am not even sure if I can come up with the words to express how I felt after reading this book. This book had me in tears. I was in tears because a little boy died, in tears because of a family's pain, in tears as I was reading how this mother was coping with grief...I was just in tears. This book was heart wrenching, but this book gives you hope and faith. Anna's faith just blew me away and is something to admire. Again, I honestly don't think that I can adequately describe this book because it's such a heavy topic, but I highly recommend this book to anyone. Have you read Rare Bird? What are you thoughts? Hello! I didn't post a Currently List yesterday so I'm going to post one today. 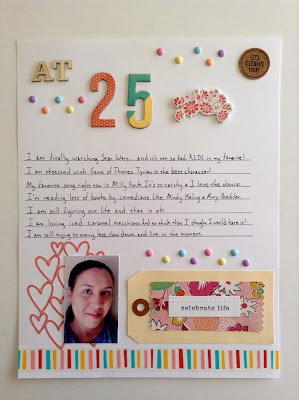 Making: I've been making lots of layouts and drafting up some blog posts. Wishing: It's been really cold. I can't wait until Spring time. I'm so ready for warmer weather. 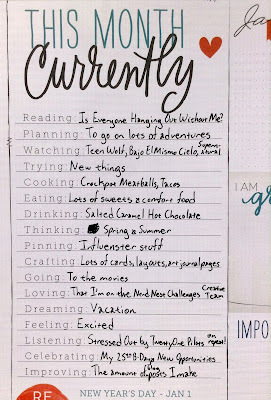 Planning: I want to go on so many adventures this year. I want to go to places that I've never been both near and far. Hopefully, this can happen this year. 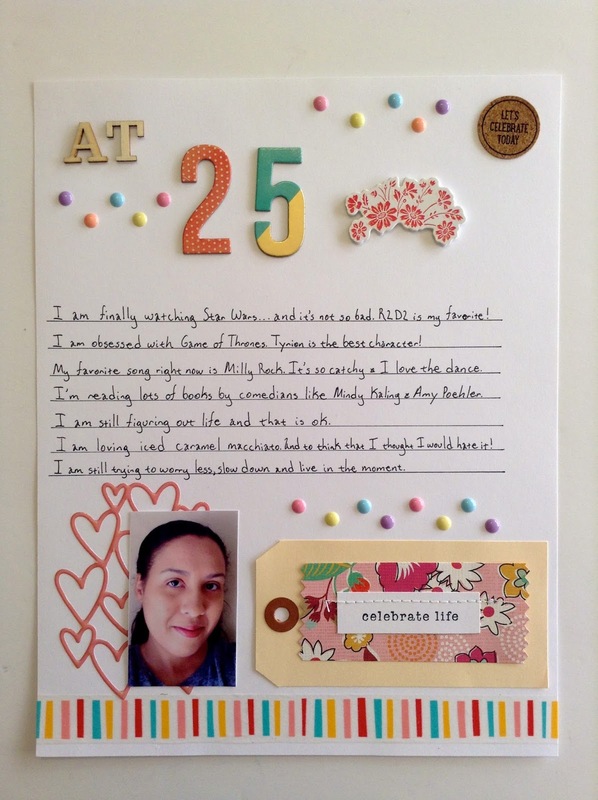 Loving: I feel so incredibly blessed to have been able to celebrate my 25th birthday. Eating: All I wanted for my birthday was a Carvel Ice Cream Cake and I'm so happy that I got it. It was so good! Hello! Today is my birthday and I am 25 years old now. Wow...I can't believe I'm a quarter of a century old. I decided to make a layout documenting this birthday. 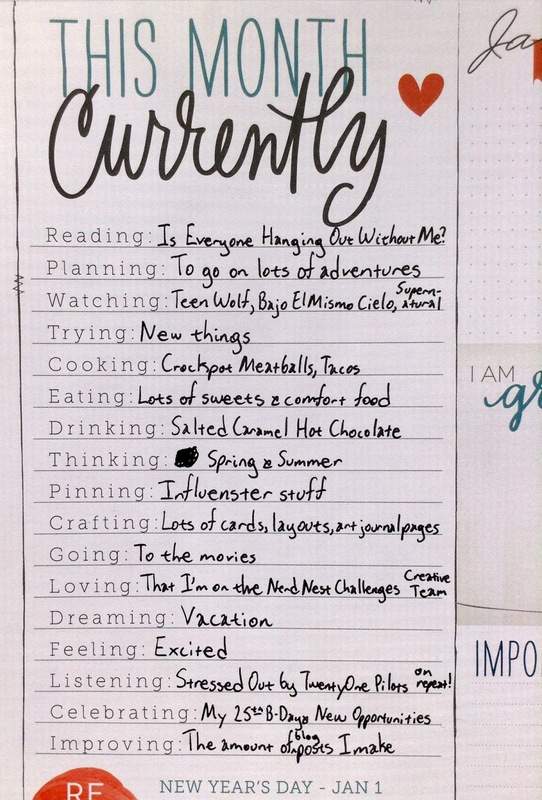 Usually, I may make a note of it in my Project Life album, but I decided to go a different route and just make a full, 8.5x11 layout describing what my likes and interests are at my age. 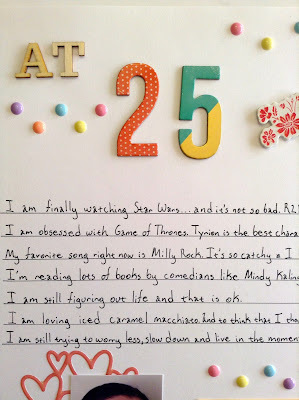 I know that there are several bloggers and memory keepers who make similar posts about their birthdays, but I was inspired by Megan over at The Nerd Nest. Megan makes lists and layouts documenting her family's birthdays and I think it's an awesome idea to jot down lists, journal, etc. about important days such as birthdays. I am finally watching Star Wars...and it's not so bad. R2D2 is my favorite! I am obsessed with Game of Thrones. Tyrion is the best character! My favorite song right now is Milly Rock. It's so catchy and I love the dance! I'm reading lots of books by comedians like Mindy Kaling and Amy Poehler. I am still figuring out life and that is ok. I am loving ice caramel macchiatos. And to think that I thought I would hate it! 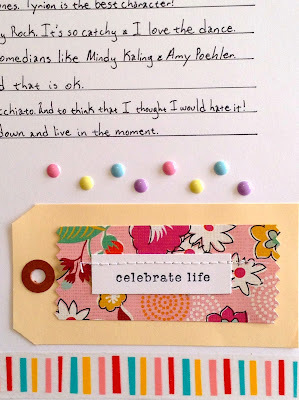 I'm loving those enamel dots and washi tape. I'm a bit obsessed with tags at the moment so I used one that I received in a giveaway. 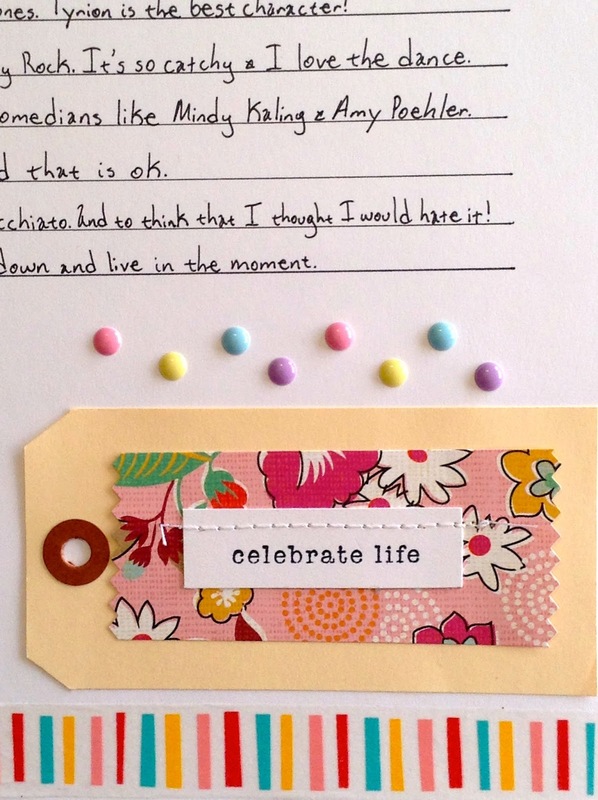 That "celebrate life" sentiment is on point! I'm also loving those thickers from American Crafts. I'm loving the American Crafts Celebrate thickers. I really like that the numbers in the pack are not the same and come in various colors. I'm starting to get into the whole mixing of patterns in my projects. Overall, I love how the layout turned out and I definitely plan to make more of these type of layouts for my family and myself. Hello! Happy Monday! I know this post is a bit late and I'm still trying to get adjusted after the holidays, but I'm hoping that everything will get back to normal this week. Today, I want to share a few Valentine's Day cards that I made over the weekend. I apologize in advance for the lighting...the weather and lighting has been a bit atrocious lately. I am trying to get a head start on my Valentine's Day cards because I definitely do not want to have to make over 40 cards the day before I have to give these cards out. I definitely learned my lesson after making Christmas cards and I will not be procrastinating this time around. I primarily used a Me & My Big Ideas products. I am currently trying to use up a lot of my stash and found almost an entire 8x8 kit from Me & My Big Ideas. I also used some accordion hearts that I found at Tuesday Morning. 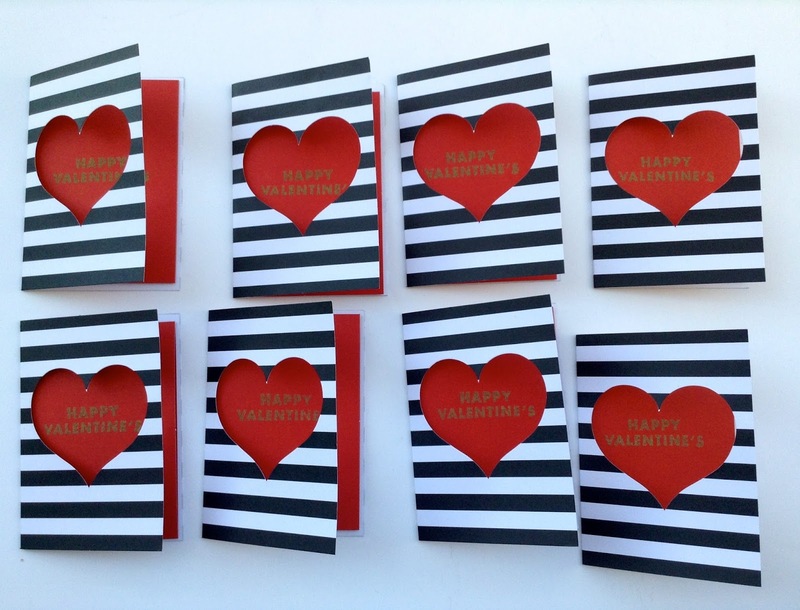 I decided to keep my cards somewhat simple and used the accordion hearts to draw a lot of attention. Then I added a few stickers to pull everything together. There is one card that doesn't have an accordion heart. I decide to add some dimensional hearts on that card because I thought a single heart would be too plain. I think my favorite cards are the ones with the hearts patterned paper. 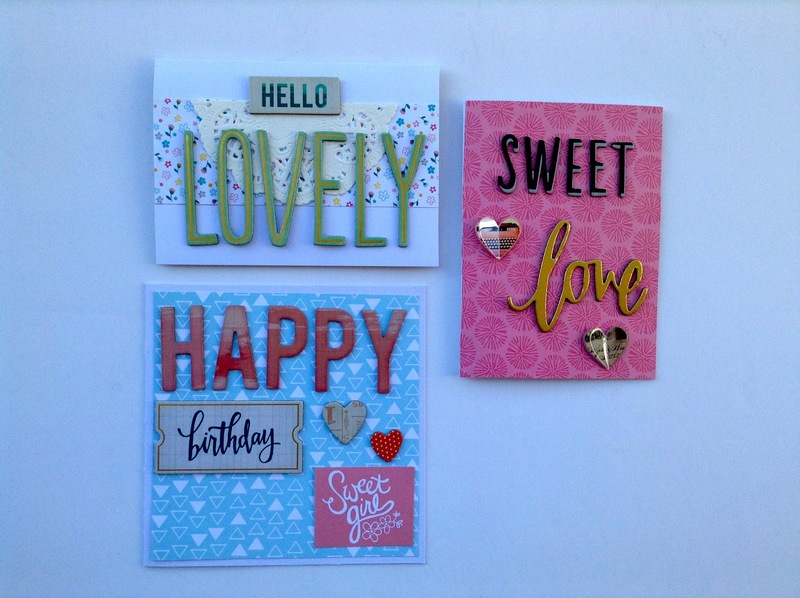 I am still surprised that I still have some more items left in the scrapbook kit which is fine because I will use it to make some more cards. 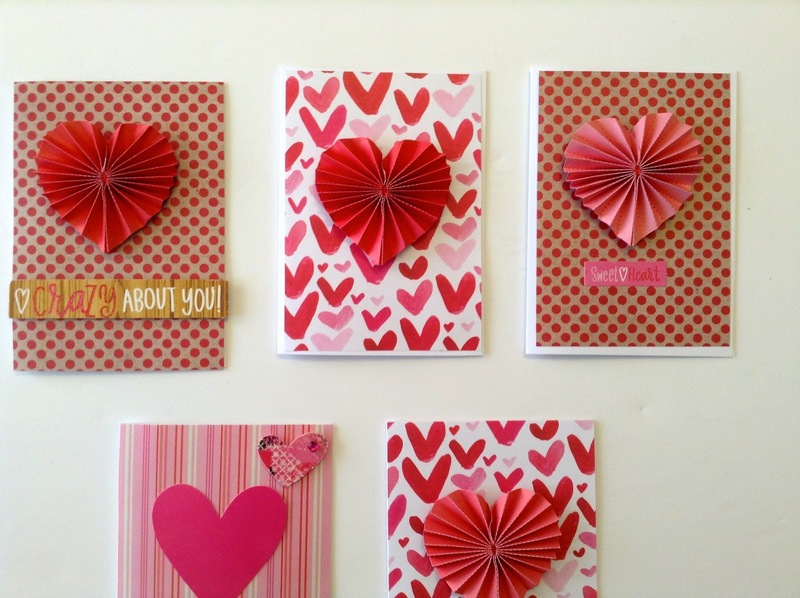 Are you planning to make any Valentine's Day cards? Have you gotten started? Super Exciting News! 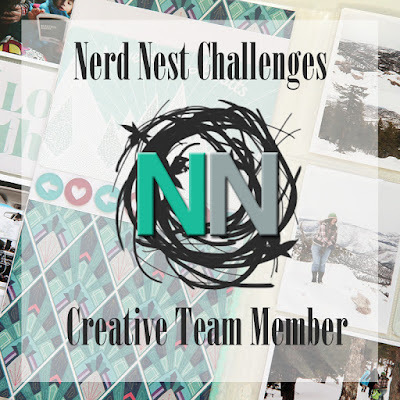 I'm a Nerd Nest Challenges Creative Team Member! Happy 2016! This year is already starting with super exciting news and awesome opportunities! As you can see from the title, I was selected by Megan over at The Nerd Nest to be a part of her Nerd Nest Challenges Creative Team! This will be my first time being on a creative team and I am extremely excited, honored, and happy to be a part of this team. My fellow creative team members and I will be sharing our take on the monthly challenges. Please be sure to check out Megan's other creative team, the Pocket Your Year, as well. They will be sharing their takes on the monthly assignments for each unit in Pocket Your Year 2016. Be sure to sign up for Megan's newsletter, The Nerd Nest Newsletter, so that you know when registration is open and to be on top of all the updates. It's going to be an amazing year! Happy New Year's. May all your dreams and wishes come true. Here's to hoping for a new year filled with happiness, love, success, and good health!